A fun companion book to I Need My Monster! Winner:CLC Seal of Approval2017 Literary Classics Book Awards, Silver, Preschool/Early Reader FantasyFinalist:2017 Literary Classics Book Awards2017 PNBA Long-List When Ethan looks under the bed for his monster, he finds this note instead: "So long, kid. Gotta go. Someone needs me more than you do. –Gabe" How will Ethan ever get to sleep without his monster's familiar, comforting snorts? And who could need Gabe more than Ethan does? Gabe must have gone to Ethan's little sister's room! She has been climbing out of bed every night to play, and obviously needs a monster to help her get to sleep – but not HIS monster! Ethan tries to help his sister find her own monster, but none are the perfect blend of cute and creepy. Just when it seems that Ethan will lose his monster forever, an uninvited, tutu-toting little monster full of frightening fun ap­pears. Following in the spooky-silly tradition of I Need My Mon­ster, here's another irresistible monster-under-the-bed story with the perfect balance of giggles and shivers. 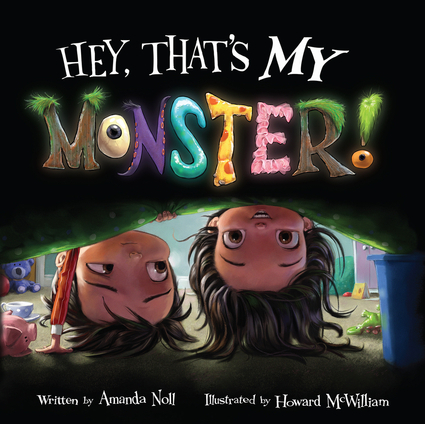 Amanda Noll teaches Library and Tech in kindergarten through fifth grade, and is the author of the award-winning I Need My Monster. She lives in Spanaway, Washington. Howard McWilliam has illustrated dozens of children's books including the award-winning I Need My Monster, When a Dragon Moves In, and When a Dragon Moves In Again. He is the cover artist of The Week (US and UK) and MoneyWeek. He lives in Cheltenham, England. School Library Journal Scholastic Book Club Selection Winner of 6 state awards: Alabama Camellia Award (2010-2011), Arizona Grand Canyon Reader Award (2011), California Young Readers Medal (2011-12), Georgia Picture Storybook Award (2011-12), Nevada Young Reader Award (2011-12), Virginia Reader's Choice Primary Award (2012-13) Included on 5 other state award lists: Mississippi Magnolia Children's Choice Award list (2012-13), Nebraska Golden Sower Award list (2011-12), South Dakota Prairie Bud Award list (2011-12), Washington Children's Choice Book Award list (2010-2011), Wyoming Buckaroo Award list (2011-12) Additionally, these regional awards lists: Connecticut Charter Oak Children's Book Award list (2011-12), Iowa Regional Goldfinch Award Winner (2009-10) Storytelling World Award Honor Book 2010 Translated into 7 languages.